With the Oakland Athletics locking up a playoff berth on Monday, it marked the sixth time since the Athletics moved to Oakland that both the Giants and A’s have advanced to the postseason. Here’s a look at how both teams fared in previous years in which both clubs reached the playoffs. That’s about all you can say about Sunday’s series finale in Oakland. While it would have been great to complete the sweep heading into the series with the Dodgers. But the Giants won two of three, and ultimately that’s the goal of every series … to win it. The Giants looked like they might get that sweep when they led 2-1 in the ninth after a stellar performance from Matt Cain. But Santiago Casilla came in, gave up two singles to go with two strikeouts before giving up a three-run homer to rookie Derek Norris on a 3-2 pitch. One pitch away from a sweep. Instead, it’s a loss. Sure, you can make the argument that Bruce Bochy should have considered other options in the ninth than Santiago Casilla, who had pitched in each of the previous two nights and not completely effectively. Actually MoreSplashHits would argue that Casilla should not have been used to protect a three-run lead with two out in the ninth on Saturday. Just because a situation becomes a save situation according to the rules doesn’t mean you automatically bring in your closer. Saturday’s game should have been finished off by committee, which eventually it was, and given Casilla day off. It would have left him fresher for Sunday. Now, having pitched in three consecutive days, Casilla will not be available Monday against the Dodgers. Of course, with Barry Zito pitching, if the Giants find themselves in a save situation Monday that will be a blessing in itself. You could argue all those points. But in the end, the Giants ended up winning a game that they probably should have lost in Oakland and lost a game they should have won. And that’s called a push. Entering this series, the Giants were 1-29 when trailing after eight innings, and they got a win Friday to go to 2-29. On Sunday, they were 35-0 when entering the ninth with the lead, and now they are 35-1. Maybe a bigger issue is how the Giants scored twice in the first inning on a Buster Posey home run, then didn’t score again. The Giants are now 1-21 when scoring 3 runs or fewer in games in Oakland. But thanks to a win by the Angels on Sunday, the Giants still only trail the Dodgers by three games in the NL West. And now onto the Dodgers, which starts a stretch in which the Giants play their next 10 games against division leaders — three with the Dodgers (NL West leaders), four with the Reds (NL Central leaders) and three with the Nationals (NL East leaders). The first-half the season ends with three against the Pirates (who are second in the NL Central). Thirteen games that will tell us a lot about how the Giants expect to contend for a division title and playoff spot in the second half of the season. After watching the Giants beat the A’s on Saturday, I was left to wonder one thing: When was the last time Giants fans were treated to a no-stress victory? So I looked it up. It was May 24. That was the last time the Giants had a stress-free win that didn’t require a save. OK, OK. There was Matt Cain’s perfect game over Astros. But I don’t count that as exactly stress-free. It was a good stress, but stress all the same. April 14 — 4-3 over Pirates: Walk-off win in ninth. April 18 — 1-0 over Phillies: Walk-off win in 11th. It looked like the Giants were headed to no-save-needed win No. 13 Saturday when they led 9-4 after seven innings. But then the wackiness that has been a staple in this series so far almost bit the Giants. The game seemed well in hand with two out and a runner on first in the ninth inning. Then Jonny Gomes walked. Brandon Inge singled home Redick to make it 9-5. Bruce Bochy then went to get Santiago Casilla for the cheapy save (the potential tying run was still on deck). But then Casilla couldn’t get the save. Derek Norris hit a bloop into left that Melky Cabrera just missed catching, scoring Gomes. Now it’s 9-6. Brandon Moss walks. Brandon Hicks hit a ball into the left-field corner that scored two and might have tied the game if it had not bounced over the wall for a ground-rule double. Now it’s 9-8 Giants. Bochy then put Javier Lopez in the game. Lopez battled with Seth Smith before walking to load the bases. On came Clay Hensley, who worked the count to 2-2 on Jemile Weeks before Weeks hit a bloop that seem destine to drop between a quartet of converging Giants in shallow center. But then Ryan Theriot was able to reach up and make the game-saving catch. If that ball falls, the A’s win. All all of Giants Nation breathed a sigh of relief. It was the topper of another strange game in Oakland. Madison Bumgarner, who got a no-decision in Seattle after eight brilliant innings of one-run, three-hit ball last Sunday, earned the win after giving up four runs on 11 hits in six innings. Nine of those hits came before MadBum recorded his first out in the third inning. Like Tim Lincecum the night before, Bumgarner regrouped to retired 12 of the last 14 batters he faced. The Giants scored four runs in the sixth inning when A’s first baseman committed three errors in the inning, two on one play alone. The Giants had more runs (9) than hits (8). That’s because they walked nine times, matching their second-highest total of the season. The Giants will go for the sweep when they send Matt Cain to the hill for a 1:05 p.m. game Sunday. Cain was supposed to face Brandon McCarthy, who is riding a six-game winning streak during which he’s post a 1.96 ERA. But McCarthy has been battling shoulder problems and cut short a bullpen session Saturday. We were hearing reports that A.J. Griffin will get the call-up from Triple-A Sacramento to pitch for the A’s. He’s 3-1 with 2.81 ERA for the RiverCats with 40 strikeouts and seven walks in 51 innings. It’s hard to label a win over a sub-.500 team in June as a pivotal game. But if this season turns out with a happy ending coming September, the Giants may look back at June 22 as a turning point. And the weird thing about it is that it looked nothing like a happy ending when this game started. Tim Lincecum took the mound Friday and seemed headed to his most disastrous start of the ugliest season of his big-league career. Lincecum had not recorded an out and the A’s had scored three runs and had the bases loaded, looking for more. Shane Loux was feverishly warming up in the bullpen. Then something flipped in the Freak. We think he just got ticked off. Lincecum would strike out the next three batters to end the inning. Lincecum would finish his night by retiring 18 of the final 20 batters he faced, allowing only two-out walks in the second and sixth innings. He gave up three runs on three hits and four walks in six innings for his first quality start since May 30 and the third this season. Almost just as unlikely was the way it ended for the Giants. Lincecum left trailing 3-1 and it looked like he was going to fall to 2-9 on the season. But the Giants rallied for four runs in the top of the ninth — Brandon Belt’s two-run double the big hit — to end a six-game losing streak in Oakland. The Giants improved to 2-29 in games in which they trailed after eight innings. Before striking out those three batters to end the first inning, Lincecum’s outing was a mixture of bad pitches from Lincecum, bad luck and bad defense. Coco Crisp led off the game with a ground ball that Ryan Theriot was able to get to, but not able to throw out the speedy Crisp. Infield single. Crisp stole second. Then Lincecum completely lost track of Crisp as he stole third — without a throw and standing up. Jemile Weeks then singled to center just past Lincecum’s glove in the hardest hit ball of the inning. At this point, you were thinking that Lincecum should just shake off that first run and reset himself. He gave up a soft liner to right by Josh Reddick. But Nate Schierholtz, in right field because Angel Pagan was out with an abdominal strain (if Pagan plays, Blanco is in right), got a bad break on the ball and allowed it to fall for a single. Lincecum then made it worse by walking Yoenis Cespedes to load the bases. Looking for an inning-ending double play, Lincecum instead got Seth Smith to ground the ball to first baseman Brandon Belt. Belt had two options here: A) throw home immediately to try to force out Weeks at home; B) take the ball to the bag, get the out there and allow the run to score. Belt chose option C. He started to run toward the bag, but never touched it before throwing home, keeping the force intact. However, catcher Hector Sanchez wasn’t aware that the force was still in play, so he was not standing on the plate when he received Belt’s throw, allowing Weeks to slide under him to score. So instead of being down 2-0 with one out and runners on second and third, Lincecum was down 2-0 with the bases loaded and no one out. He made matters worse by walking Brandon Inge to make it 3-0. Then, suddenly, just as things looked as if everything was going to completely unravel, the Lincecum of old showed up. With his three first-inning strikeouts, Lincecum threw 43 pitches in the first inning. He would throw 62 over the next five innings to finish with 105. Hopefully, HOPEFULLY, this is the start Lincecum has been looking for to turn the corner. It was against the A’s, the worst-hitting team in the majors. But at this point, we’ll take any positive step we can get. Lincecum’s next start will come Wednesday afternoon at home against the Dodgers and Chad Billingsley, a pitcher who has been battling struggles of his own. After winning a game that looked like the worst pitching matchup of the series for the Giants, San Francisco will try to win Game 2 with its best pitching matchup when Madison Bumgarner takes on Tyson Ross at 4:05 p.m. Saturday in a game televised by FOX. As the Giants return to the Bay Area to conclude interleague play with a three-game series at Oakland, they hit a bit of a crossroads. The A’s are the only team currently with a losing record that the Giants will face prior to the All-Star break. And the A’s aren’t exactly struggling right now either. They just swept the Dodgers, holding L.A. to two runs in three games. Oakland has won eight of their last nine to push their record to 33-36. To make matters worse for the Giants, they haven’t won a game in Oakland since Randy Johnson was their starting pitcher — in 2009. They’ve dropped their past six on the east side of the Bay. The key to winning in Oakland this weekend? Score more runs. OK, that seems a bit obvious. But if you look back at this series, the Giants have won their last seven games in Oakland, dating back to 2004, when they’ve scored four runs or more. When they score three runs or fewer in Oakland, they are 1-20 dating all the way back to 1997. By comparison, in all of their games this season when the Giants score 3 or fewer runs, they are 9-20. In their past six games in Oakland, they scored a total of six runs. The key to the Giants’ low-scoring in the Coliseum is two fold. One, it’s a tough park to hit in with its deep, high outfield walls and roomy foul territory. The other factor? Really good Oakland pitchers. The A’s will throw some good arms at the Giants … young, but good arms. It starts Friday when Jarrod Parker takes the mound. Parker had one of his worst outings of the season against the Giants on May 18 when he gave up six runs on four hits and four walks in two innings. In two of his 10 starts, he’s been tagged for six runs. In his other eight, he has not allowed more than two. Counter that against Tim Lincecum, who will pitch for the Giants. Lincecum has allowed two runs or fewer in only three of his 14 starts. The key for Parker will be throwing strikes. When his walk count goes up, that’s when he gets into trouble. Lucky for him, taking walks is something the Giants have not been prone to do. The Giants have not draw more than three walks in a game since June 12, a stretch of eight games. The Giants are 3-5 in those games. Saturday’s game brings a more favorable pitching matchup for the Giants, when Madison Bumgarner takes on Tyson Ross. Ross has 2-6 record with a 6.11 ERA (so Lincecum isn’t the only starting pitcher in this series with a 6+ ERA). The Giants beat Ross on May 19 in one of his better outings, when he gave up two runs on seven hits and four walks in six innings. The Giants won 4-0. Sunday’s game features Matt Cain (9-2, 2.34 ERA) vs. Brandon McCarthy (6-3, 2.54 ERA). McCarthy has walked just 19 batters in 12 starts this season. If the over/under on the number of walks the Giants will draw on Sunday is 1, take the under. Tim Lincecum pitched great on Sunday, until …. Once again, the big inning and Lincecum’s inability to get out of trouble jumped up and bit the Freak. FIRST INNING: Strikeout, strikeout, walk, strikeout. SECOND INNING: Groundout, strikeout, fly out. THIRD INNING: Groundout, strikeout, triple, groundout. Through three innings, Lincecum had given up one hit and one walk and struck out five on 55 pitches. The fourth went groundout, single, single, walk, infield single (3B Joaquin Arias was able to field a grounder on the line but not able to make a play), single, force out, wild pitch, walk, groundout. In all, four runs on three hits and two walks — 35 pitches. After a high-stress inning that included Lincecum taking a shot on the chin from the head of Collin Cowgill when he slid home to score on a wild pitch, manager Bruce Bochy lifted Lincecum for a pinch-hitter, having thrown 90 pitches in four innings. A couple of weeks ago, we called it an anomaly. Now, it seems like a habit. Well, if that’s so, Lincecum is the unluckiest guy around. Lincecum is creating his own luck, by falling behind in counts. It’s not that Lincecum is getting hammered. But he’s being killed by a thousand pin pricks. And he can’t get out of big innings. 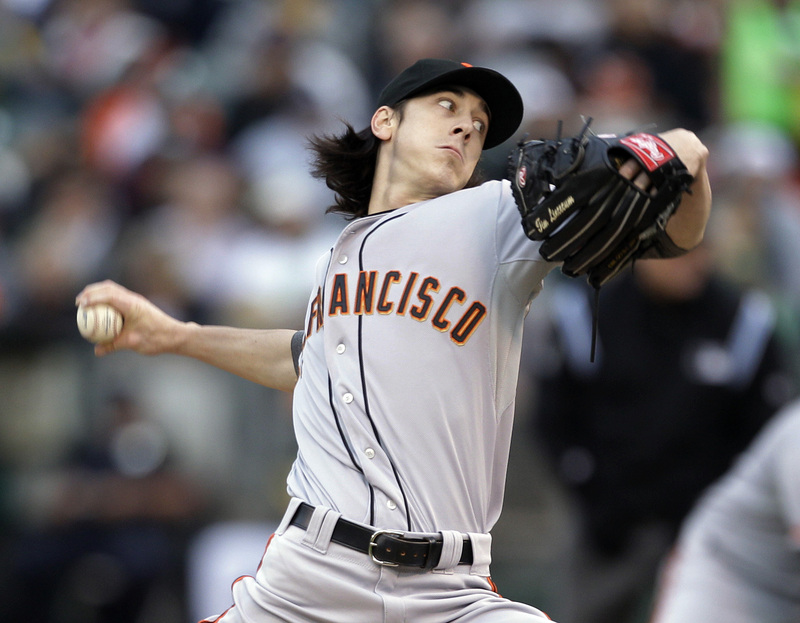 Manager Bruce Bochy seems to think the problem is in Lincecum’s head, not his arm. The Freak seems to agree. Lincecum’s next start comes Friday at Miami, then May 30 at home vs. Arizona. Let’s hope he finds some trust before then. The Giants open a seven-game road trip to Milwaukee and Miami, two cities close in the alphabet but not on the map. Monday’s opener features Madison Bumgarner vs. Randy Wolf in a rematch of a Giants’ 5-2 win in San Francisco on May 4.